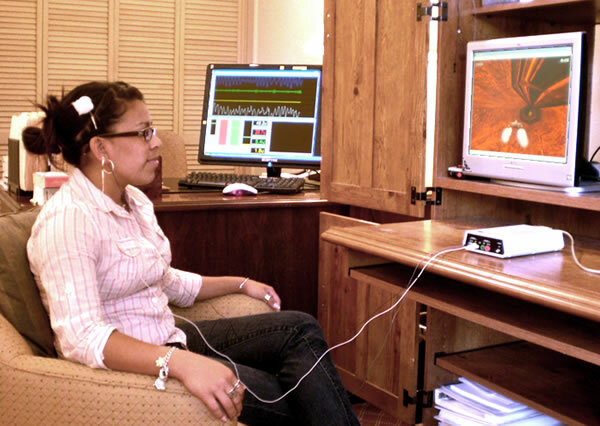 Neurofeedback has a number of components, including: the electroencephalogram (EEG), operant conditioning and a computer system. The EEG measures the tiny electrical traces of the neurons of the cortex of the brain. An amplifier is used to boost these signals so that they can be feed into a computer system. Certain brainwave frequencies are associated with distinct mental states. For example, concentration produces an increase in brainwave activity in the frontal lobes in a fast frequency range known as “beta.” Persons with ADHD, conversely, tend to have a higher than normal level of slow wave activity instead, such as delta or theta. Operant conditioning is a process of increasing desired behaviors by rewarding their occurence. In EEG biofeedback, or neurofeedback, the desired behavior is an increase in certain types of brainwave activity. 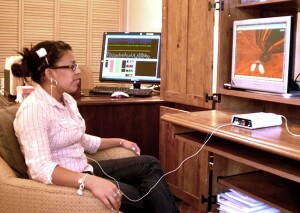 This activity is measured measured via the EEG and fed into a computer program where the therapist can determine what types of activity should be rewarded. The reward is then presented in the form of a computer game. When the person produces the desired brainwave activity, the game proceeds accordingly. After a number of training sessions, the new brainwave behavior is well established. QEEG-guided neurofeedback makes use of a comprehensive EEG assessment in designing the training protocols. Z-score neurofeedback provides the capability of training numerous metrics simultaneously, comparing brainwave activity to a normative database in real time. LORETA Z-score neurofeedback utilizes a 3-D localization of brain function—targeting the source of activity deep in the brain that traditional neurofeedback is unable to reach.